Product #22054 | SKU MCN-MUB | 0.0 (no ratings yet) Thanks for your rating! 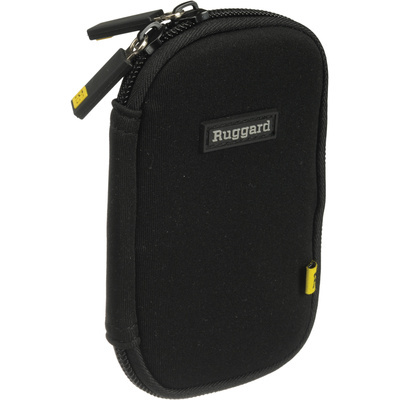 The Ruggard Neoprene Protective Pouch for Memory Cards is a neoprene case that holds and protects up to 6 memory cards in laminated mesh pockets. It supports virtually all memory card types, including mini, micro and full-size SD/SDHC/SDXC, CompactFlash (CF) Type I and II, Memory Stick, SmartMedia, MMC, xD-Picture, and XQD. The case also has a long mesh pocket that can hold a PC card or batteries. A belt loop allows for easy, convenient transport. The pouch has a zipper closure. Holds and protects up to 6 memory cards in laminated mesh pockets. Supports virtually all memory card types, including mini, micro and full-size SD/SDHC/SDXC, CompactFlash (CF) Type I and II, Memory Stick, SmartMedia, MMC, xD-Picture, and XQD. Long mesh pocket in rear of case holds a PC card or batteries. Belt loop allows for easy, convenient transport.